With the imminent launch of the Hyundai Eon, the Indian small car market will soon see a new proposition. The Eon will be the first entry-level car that will be stylish and good-looking – a departure from the value-for-money proposition that all small cars are positioned around. In the run-up to the Eon launch, let’s take a look at another small car that recently with its diesel offering has attempted to change the entry-level car proposition significantly. Here’s a look at the Beat’s proposition, its variants and their prices. The Beat diesel is powered by a 936 cc, 3-cylinder “Smartech” diesel engine that produces 57.2 bhp (58 PS) of max power and 150 Nm of max torque, while returning a mileage of 24 kmpl (claimed). The Beat’s rear has a twin-barrel taillight cluster which are quite attractive. 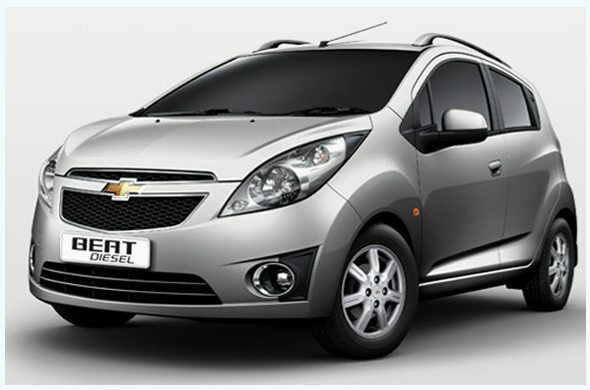 The seven spoke alloy wheels, roof rails and rear roof spoiler add a sporty flavor to this city car. The base Beat diesel comes with integrated rear spoiler, AC, power steering, tachometer, height adjustable front headrests and bottle holders in door trims. The mid trim Beat diesel is equipped with all the features of the base trim plus front power windows, central locking, 60:40 split rear seat, digital clock, day/night rear view mirror, passenger vanity mirror, height adjustable rear headrests and rear parcel shelf. The top-end Beat diesel comes with all bells and whistles such as automatic climate control, tilt steering, integrated audio system with four speakers, rear power windows, rear wash and wipe, rear defogger, sunglass holder and front fog lamps. The 1.2 LT (O) variant gets all the features of 1.2 LT plus alloy wheels, ABS, dual airbags and front seatbelts with load limiters.